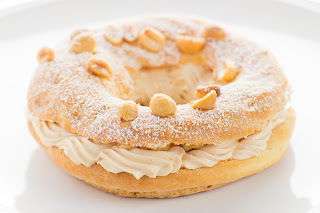 I loved assembling the Paris-Brest. The structure is just so pretty. I liked this twist on the classic of having a peanut butter pastry cream filling. It was a lot of work creating it though from the pastry cream turned into diplomat cream, that was then incorporated with a buttercream and peanut butter. The flavor was fantastic. I will say I went rogue and did a couple of changes that I normally wouldn't do but I thought they would be okay without disrupting the integrity of the pastry. Another delicious pate a choux recipe! Again, this one uses 3 different creams plus peanut butter to create the filling. I chose to omit the diplomat cream because I again didn't want to make a whole batch of pastry cream just to use a little bit. So instead I used just buttercream and peanut butter together, which was delicious. I only had a little bit leftover, but I didn't fill all the pastries, only 2. The filling was so rich but still light, which I love about the buttercream. I also thought about using jam like Jenn, but decided to forgo that for next time. 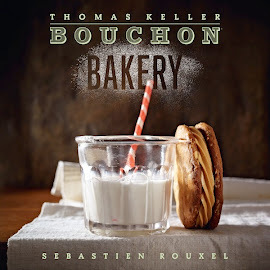 This recipe felt like second nature, having made the choux so many times before. I had a guest photographer this week, my friend Nick (click for website) came over with his fancy photo equipment and we had a real photo shoot. It was a lot of fun trying different angles and settings and lighting. The end result is just beautiful, as you can see. Check out Julie's blog for her results, she loved making these as well!